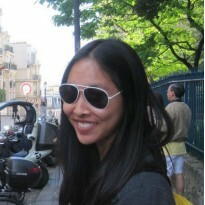 The Day Before - Lis Les Livres- Read Books! 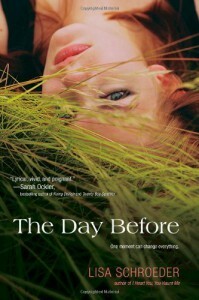 http://lisleslivres.blogspot.com/2012/12/review-day-before-by-lisa-schroeder.htmlCharacters: Both Amber and Cade have a lot of baggage. They've both got their issues, but they forget about them for the one day, and they act like normal teenagers for most of it. Yet, their secrets loom over their heads, which makes them both very elusive, especially Cade since Amber was narrating the story. Even though it's just one day, the characters have a tremendous growth, and you can't help but sympathize.Plot: I guess I didn't read the summary, but I wasn't expecting Cade's reasoning for being out of school. Looking back on it now, I think you can get a pretty good inking of it. There's an emotional, dramatic tone to this one. Overall, there really isn't much plot to discuss because the book is super duper short. Writing: This was my favorite part. It was written in "lyric," so poetry for the common folk's mind, sans verbosity. The stanzas end up taking up a lot of the page, so I was able to finish this and her others in two hour each. I also loved that the author put in so many pop culture references. Would I recommend it to a friend? Yes, I love these emotional books but even if you don't, you should try it. If you don't like it, it'll be over really quickly anyway.